Zipper type seal makes these bags reclosable and perfect for items that need to be kept fresh. Meet FDA requirements for food applications. Large seal track makes seal secure. Reclosable poly bags have an advantage in that they require no special equipment to seal. 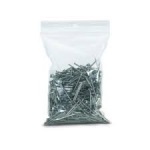 Resealable poly bags are useful when needing to store or package items which need to be accessed frequently. Poly bags are exceptionally clear and do not become brittle with age.